Habit: Perennial herb, glabrous; monoecious; rhizomes or stolons long; colonial, in wet soil to aquatic. Stem: aerial stem 1, +- cylindric. Leaf: basal and cauline, alternate, 2-ranked, spongy; sheath open; ligule 0; blade +- linear. Inflorescence: spike-like or of spheric, unisexual heads; staminate flowers or heads distal to pistillate ones. Flower: small, densely-packed. Staminate Flower: filaments fused proximally. Pistillate Flower: pistil 1, ovary superior, ovules 1--2(4). Fruit: follicle, splitting in water, or drupe-like. Genera In Family: 2 genera, +- 32 species: worldwide. Stem: erect, simple, cylindric, firm, air cavities 0. Leaf: ascending; blade C-shaped or planoconvex in ×-section proximally, flat distally, internal air cavities large; sheath-tip lobes present or not. Inflorescence: terminal; flowers 1000+; staminate flowers distal, mixed with many papery scales; pistillate flowers proximal, clustered on peg-like compound pedicels; bractlets many, thread-like with enlarged tips generally visible at spike surface, or 0. Staminate Flower: stamens 2--7 on slender stalk; filaments slender, generally deciduous in fruit. Pistillate Flower: stalk long-hairy, persistent; ovary chambers 1, style 1, persistent, stigma 1; many modified pistils with enlarged sterile ovary, style deciduous. Fruit: fusiform, thin-walled, yellow-brown, wind-dispersed. Species In Genus: +- 15 species: boreal to tropics worldwide. Etymology: (Greek: to smoke or emit smoke) Note: Dissecting microscope ideal for Typha identification (flower structures small), which is complicated by hybridization. Unabridged Note: Typha angustifolia × Typha latifolia (Typha × glauca Godr., pro sp.) 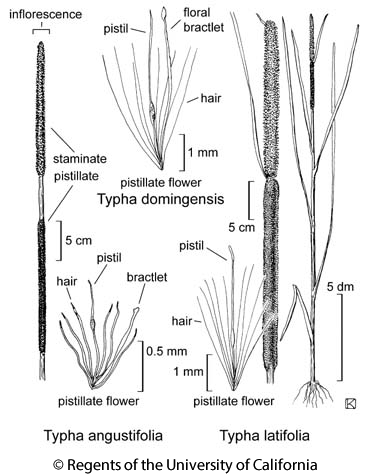 and Typha domingensis × Typha latifolia (Typha × provincialis A. Camus) are generally highly sterile and intermediate between parents in most characters. Typha angustifolia × Typha domingensis are generally highly fertile, thus species boundaries are locally obscure. Hybrids involving 3 species are locally common. Although putative hybrids may produce no or few seeds they generally form long-persistent clones. Habit: Plant 15--40 dm. Stem: 3--4 mm diam near inflorescence. Leaf: sheath-tip lobes ear-like, membranous or 0; widest fresh blades 6--18 mm wide, dry 5--15 mm wide, orange-brown gland-dotted adaxially on proximal 1--10 cm. Inflorescence: naked stem between staminate, pistillate flowers (0)1--8 cm; staminate scales generally strap-like, tips widened, generally irregularly dissected, yellow-brown; pistillate spike cinnamon to medium brown; compound pedicels short, +- blunt, peg-like in fruit, +- 0.7 mm; pistillate bractlets acute to acuminate, length > pistillate flower hairs, width >= stigma width, straw-colored to light brown, generally paler than stigma. Flower: pollen grains single; stigma linear, +- white in flower, medium- to yellow-brown in fruit; sterile ovary visible at spike surface, +- = pistil hair tips, straw-colored; pistil hair tips +- swollen, straw-colored with large orange-brown spot. Chromosomes: 2n=30. Ecology: Nutrient-rich freshwater to brackish marshes, wet disturbed places; Elevation: < 1500 m. Bioregional Distribution: NCo, NCoRO, GV, CW, SW, GB, D; Distribution Outside California: to Alaska, eastern North America, worldwide warm temperate, tropics. Flowering Time: Jun--Jul Note: Very variable worldwide; needs study. Unabridged Note: Plants in southern California are generally small, with lobed leaf-sheath tips. Occasional invasive weed in nutrient-rich places, e.g., in Florida Everglades, Costa Rica. Citation for this treatment: S. Galen Smith 2012, Typha domingensis, in Jepson Flora Project (eds.) Jepson eFlora, http://ucjeps.berkeley.edu/eflora/eflora_display.php?tid=47463, accessed on April 19, 2019. NCo, NCoRO, GV, CW, SW, GB, D; Markers link to CCH specimen records. Yellow markers indicate records that may provide evidence for eFlora range revision or may have georeferencing or identification issues. Purple markers indicate specimens collected from a garden, greenhouse, or other non-wild location.